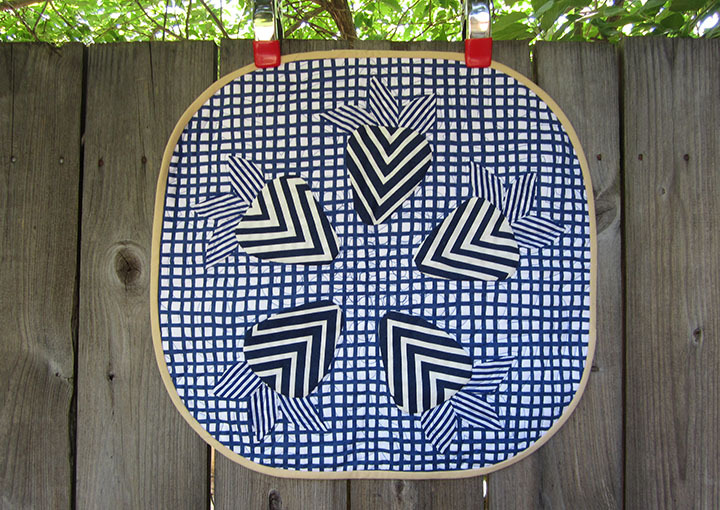 Blotch and Thrum: Handwork Hextactular! 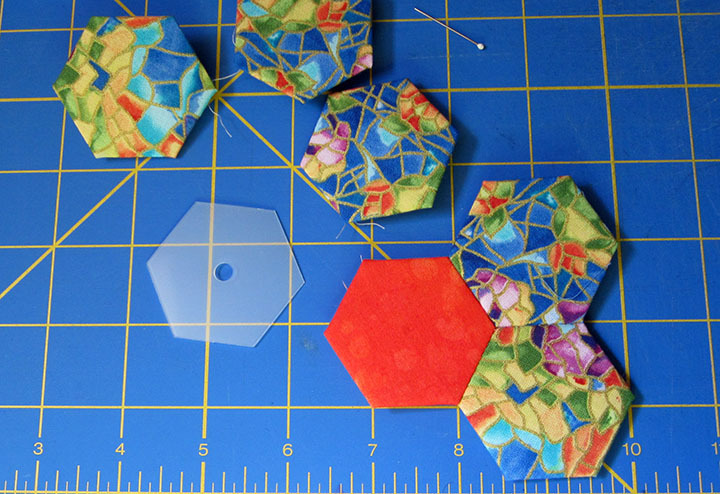 I don't know what happened to me, I used to be all machine everything, and then I inadvertantly learned English Paper Piecing, made a pincushion or two (or three), and then, the rest was history. And I also picked up Sarah Fielke's newest book from Pink Castle Fabrics, Old Quilts, New Life. And while I meant to savor it over the week, I pretty much read it in two days, it's so delicious. And we got a book from the library about the local quilt history (local to my parents, that is), and it's got all these needle-turn applique album quilts, and I was all, wow, I need to get into that, so when I got home I ordered some books on applique. And I started on a Whig Rose block using a pattern from a 1970s McCall's Quilting book, which is apparently a faithful tracing of a 1860's quilt, though I of course decided their center flower was too fussy, so I am going my own way there, uh, eventually. It's a bit wrinkled from falling to the bottom of my bag. Well, this project has been a bit abandoned of late! Our local modern quilt guild is having a food themed mini quilt challenge this month, so after I finished my leaves, I started on that. It's needle-turn applique, too, of course. 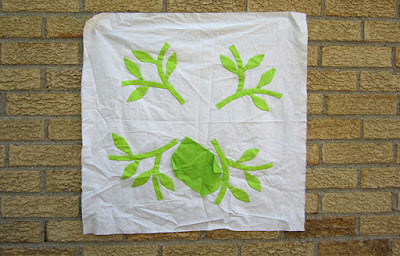 But these were all too busy and sweet, so I took it back a few thousand fold, and went with 5 fold symmetry (sort of?) to suggest the strawberry flower, and ended up with this. I had a discussion with my friend about how to keep strawberries from being to sweet, and one idea was to use nontraditional colors, and once that was mentioned, I was all, I like navy! and I like the interaction of navy and white with navy and white to blur the edges of the elements, and to that end, I used navy thread to quilt it, too. I rounded the edges to rid myself of some of the echo quilting that went to far. Privately, I call it "Heavy Metal Strawberry," but that may not be the best name for the show so I entered it in as "Untitled." But since that one is finished, I've returned to my V and Co hexagons! I am trying to make a bag, but I am struggling to get enough for the large size. I started doing 2 of each design, now I'm doing 3! And some solid green to fill in the rest. I mean, eventually. 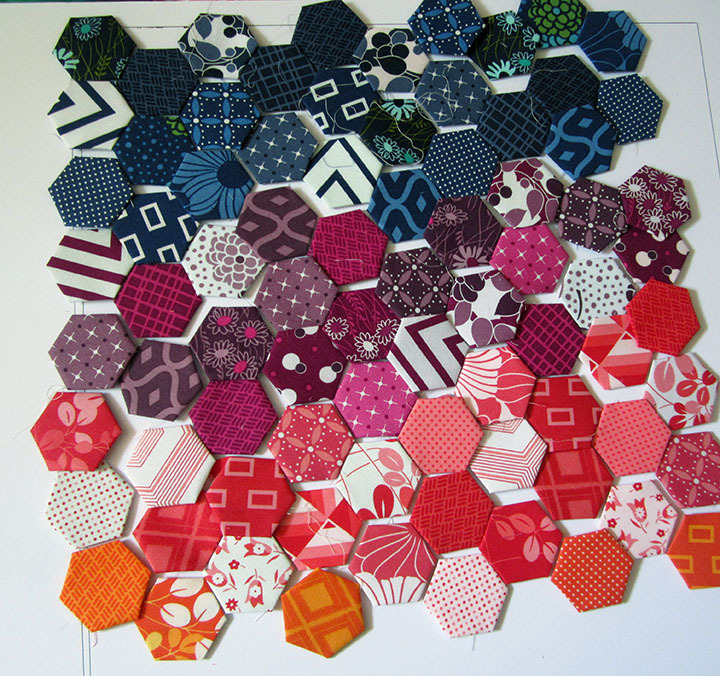 And then yesterday, I took Cathy Miller's Hexagons: State of the Art class, which was amazing. And her quilts! We learned many, many ways of making hexagons. And even with the techniques I thought I knew, I learned so much, and really better techniques then I had learned that first time. Look, Ma, no visible stitches! She gave us some of these funky plastic templates in our class kit, they're called Quilt Patis, and they are apparently indestructible (though you can't iron them, I asked! ), so they can be reused forever (unlike paper pieces), and they are flexible. You use the hole to pin the fabric in place while you baste, and once it's sewn up, you pull the template out by inserting a chopstick in the hole. 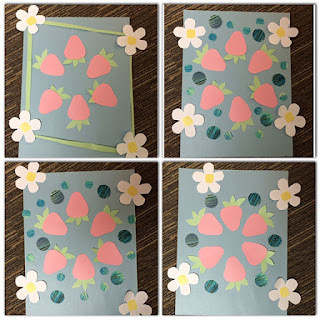 And then we did glue basting with paper templates, and seriously, this is the first time it made sense, because when I tried it before, I was apparently doing it wrong? And talked about fussy cutting! 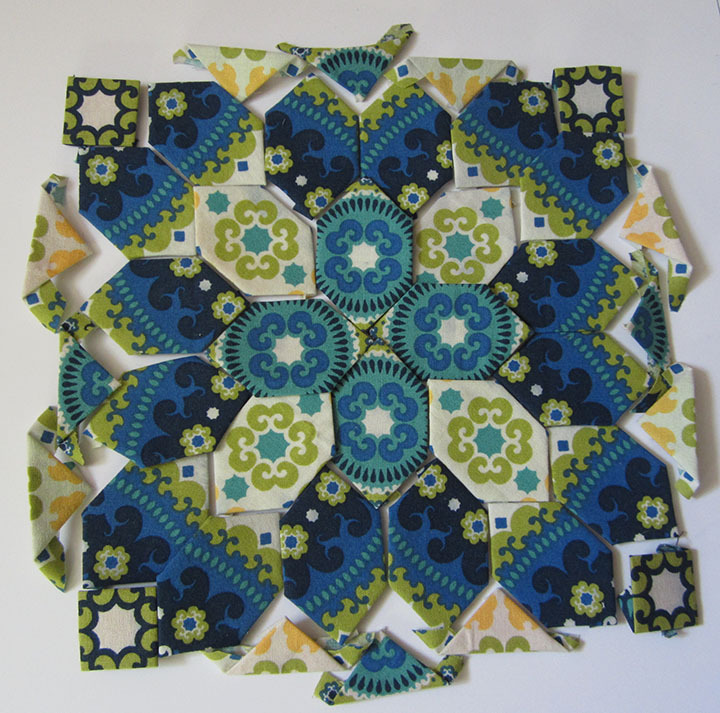 She gave us each one fat quarter of complex fabric, and then we tried to cut 24 elongated hexagons for Lucy Boston blocks. I didn't manage them quite symmetrically, not with a fat quarter, so some are mirror images. And now I have another thing to sew up! But! Another thing Cathy pointed us to was Marti Michell's Magic Mirror to help with fussy cutting for symmetric designs, which I'd been wanting for my applique forays anyway, but could not find in google searches without a proper name. So I have ordered one of those, while I sit on my hands to order every other thing related to hexagons that she suggested. Which was many, many things. It was very comprehensive; I have only mentioned 2 of the 5+ techniques we talked about here! 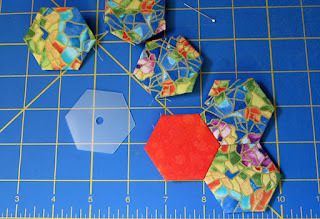 The idea I was most excited to hear about is the pieced fabric hexagon (kind of kin to fussy cutting, except you make your own fabric), from Mickey Depre. And one day, when I am done all this handwork, I will buy her books and jump in! Those black and white strawberries look delicious!